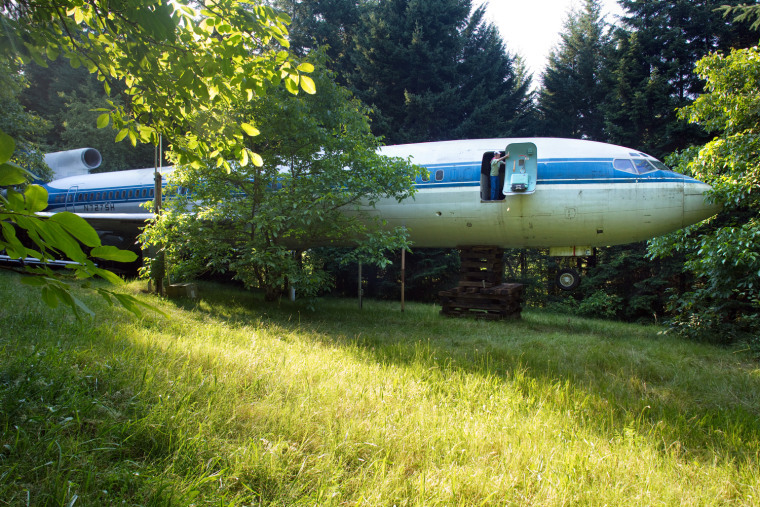 Bruce Campbell opens one of nine exits in the Boeing 727-200 that he converted into a home in rural Hillsboro, Oregon. 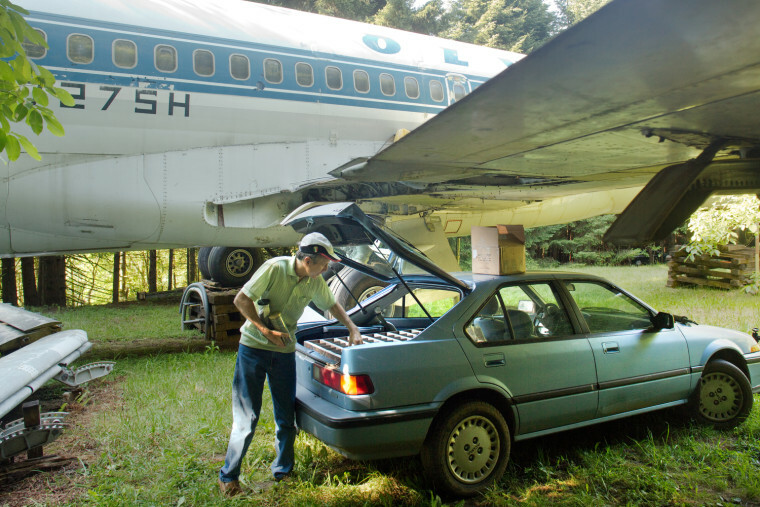 He acquired the jet at the end of its flying life from Olympic Airways in Greece, had it flown from Athens to Oregon, and finally towed to his land. Campbell relaxes on the futon that serves as couch and bed. 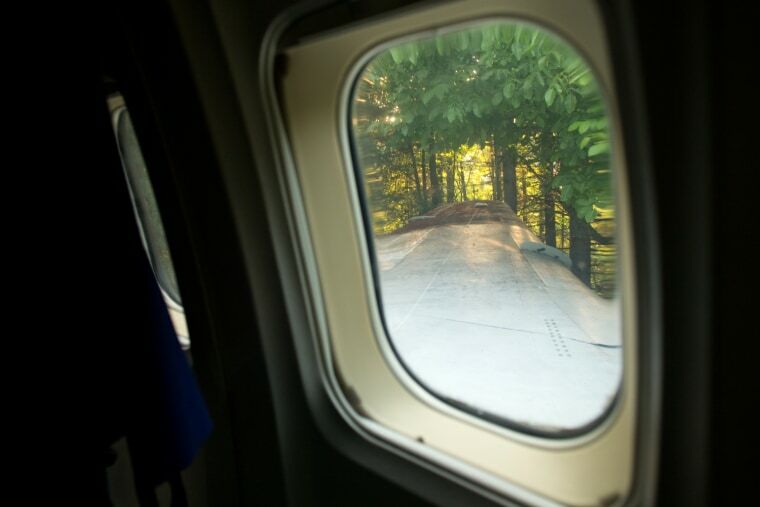 The cabin's interior is about 130 feet long by 12 feet wide. 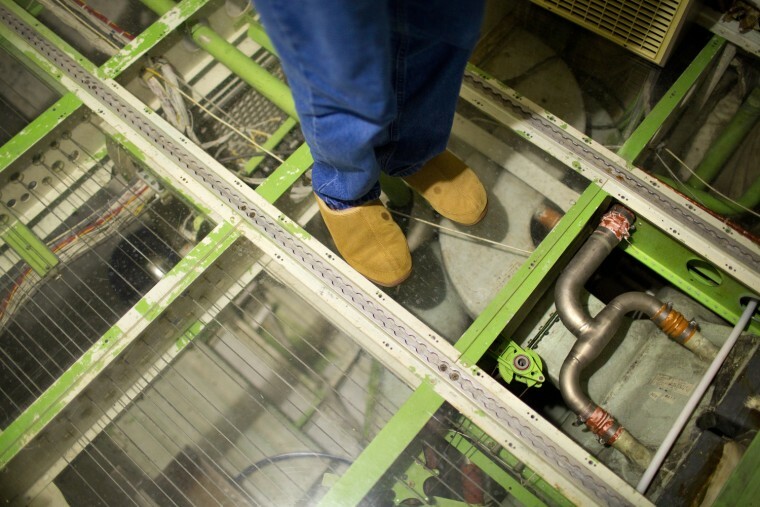 Campbell replaced the plane's composite floorboards with transparent plexiglas to reveal usually-hidden engineering details of the 727 such as bundles of wiring, green aluminum beams and the titanium air duct at right. The left wing juts into the forest surrounding Bruce Campbell's home. The 727's wingspan is 108 ft.
Campbell leans out over the plane's right wing. 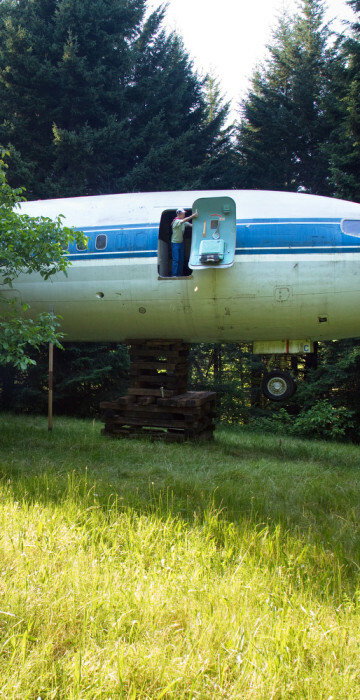 Campbell is weighing a decision about whether to continue refurbishing this airplane home or move on to a new project with a larger aircraft, perhaps a 747 with four times the cabin square footage. Campbell unloads his car, parked beneath the jet's right wing. 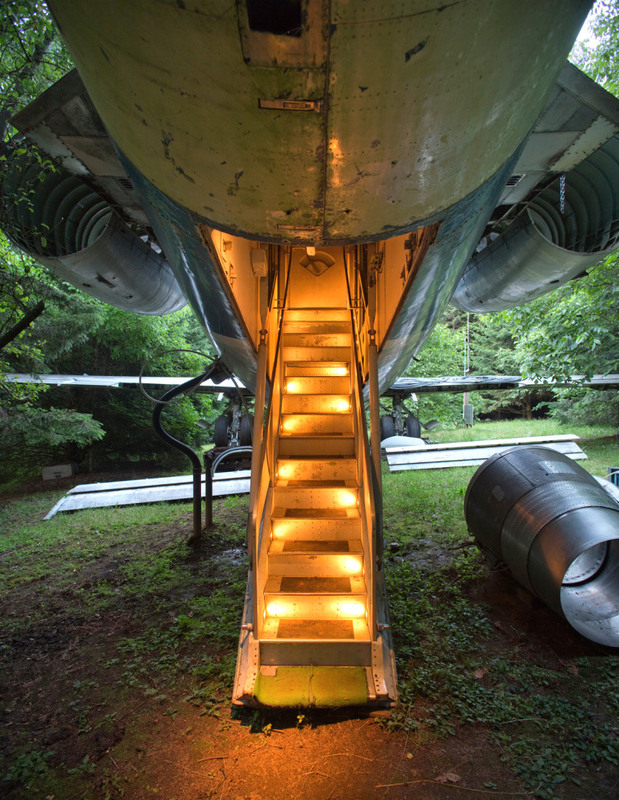 Close to 90 percent of the airplane's weight is borne by the main landing gear, to Campbell's left. 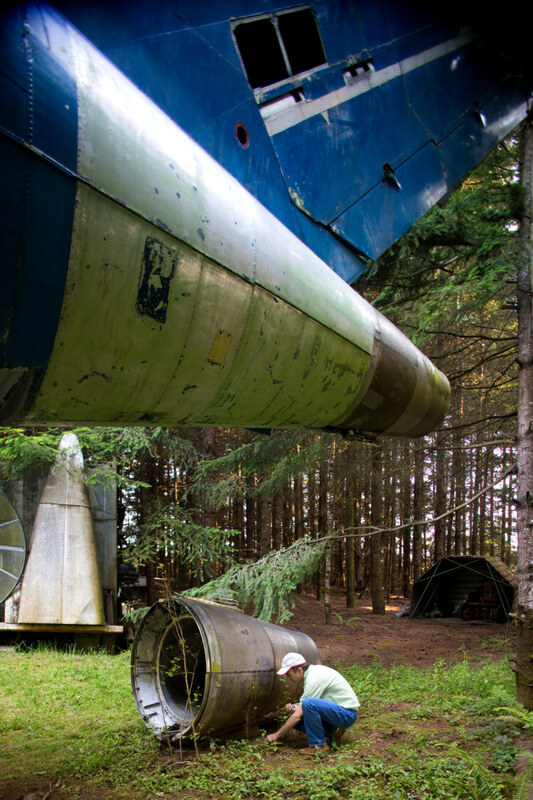 Campbell picks up small fragments of blue paint that fell when he recently pressure-washed the fuselage. 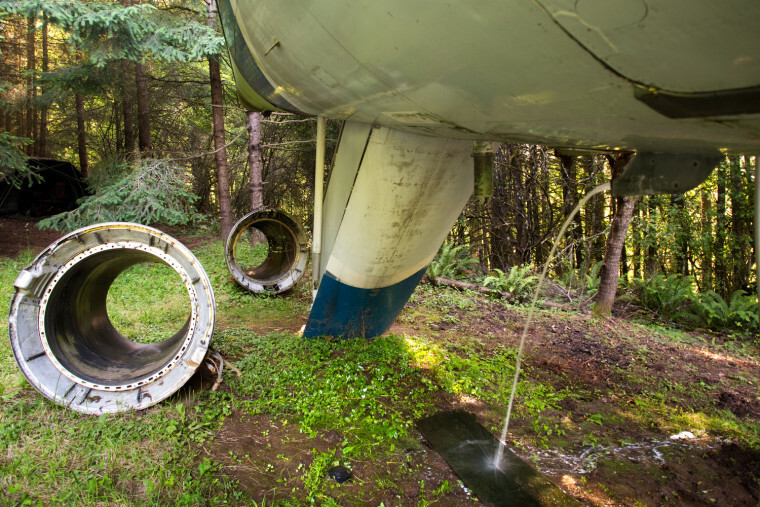 Pressure-washing is a regular maintenance duty in wet and forested areas of the Pacific Northwest, though Campbell says the task goes quickly on the smooth-skinned aircraft. On the ground next to Campbell is a thrust-reverser from the rear engine, used for decelerating the plane after landing. 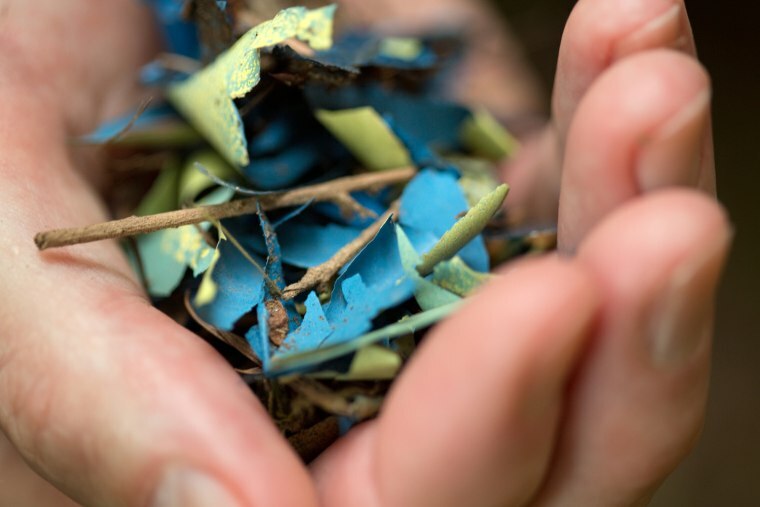 Campbell holds small fragments of blue paint that fell when he recently pressure-washed the fuselage. The rear staircase serves as the primary entry to the home. This picture is stitched from three frames. 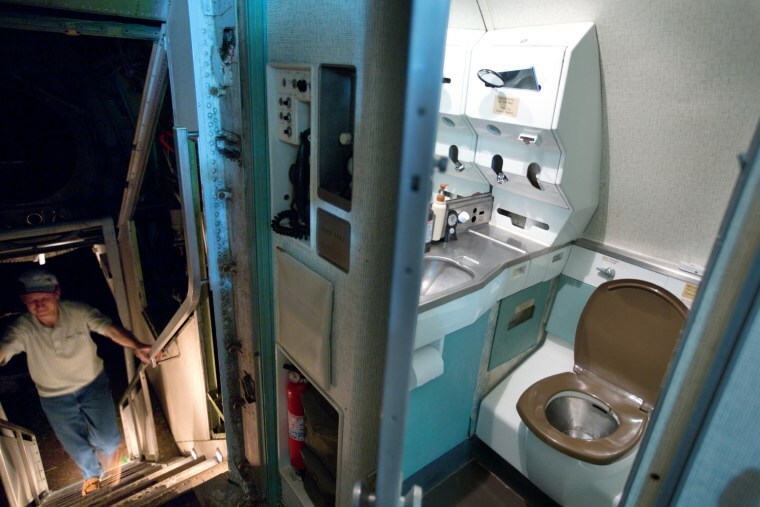 The rear lavatory next to the staircase is one of three aboard the plane, but is the only one currently functioning. 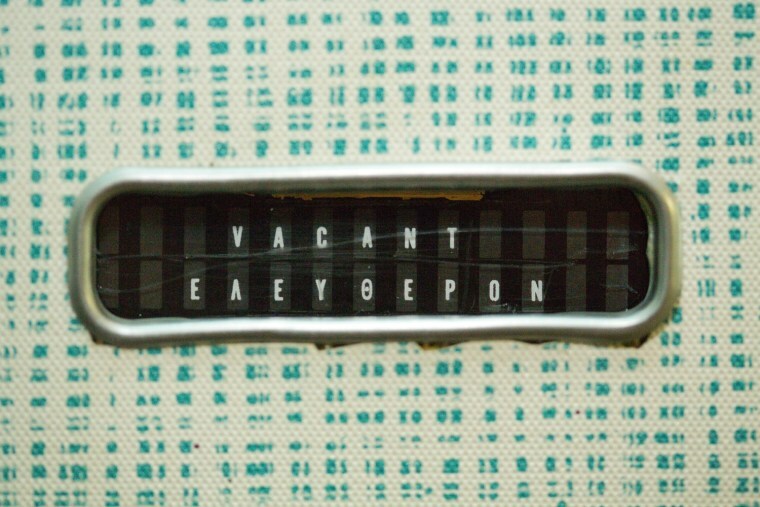 The VACANT-OCCUPIED slider has Greek translations, like other signage aboard the plane. The 727 made 43,000 flights in service to Olympic Airways. According to the aircraft’s records, the jet carried Jacqueline Kennedy Onassis and Sen. Ted Kennedy in 1975 as they accompanied the body of Greek shipping magnate Aristotle Onassis for burial on a private island off the coast of Greece. 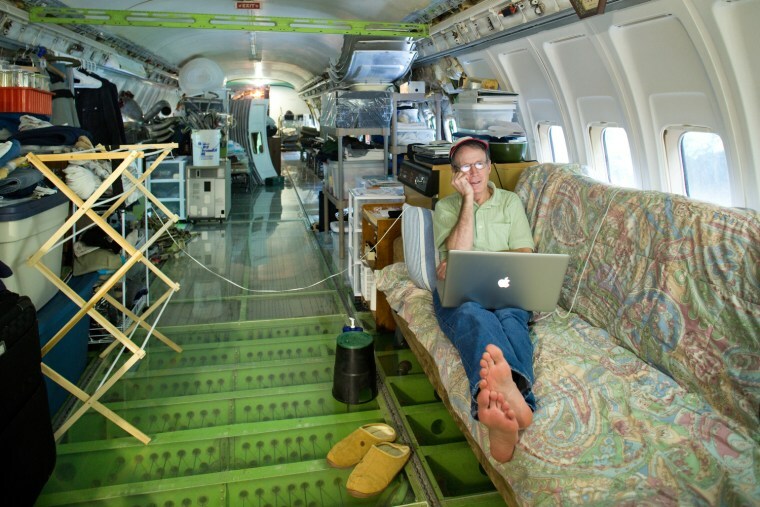 Campbell talks on the phone in the middle of his plane's cabin. The white desk at left is the workbench where Campbell, an electrical engineer, runs his business: building high-current milliohm meters used primarily for testing medical technology equipment for shock hazards. 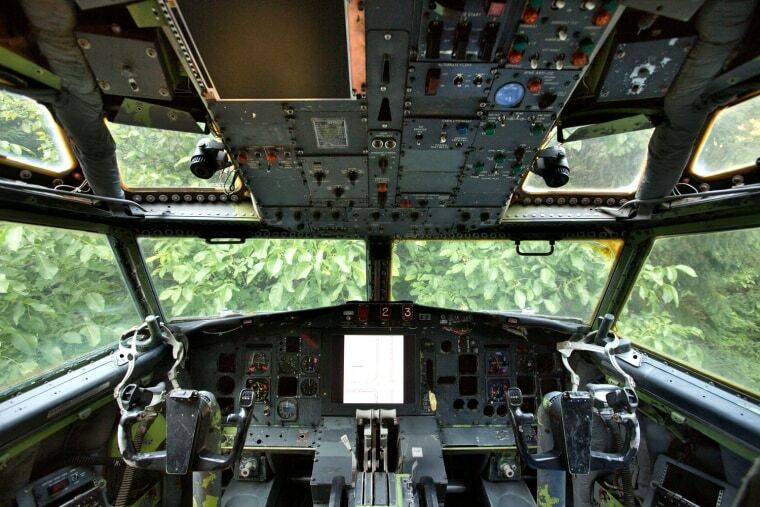 The cockpit view is dominated by a large walnut tree, left over from the land's previous use as a walnut orchard. 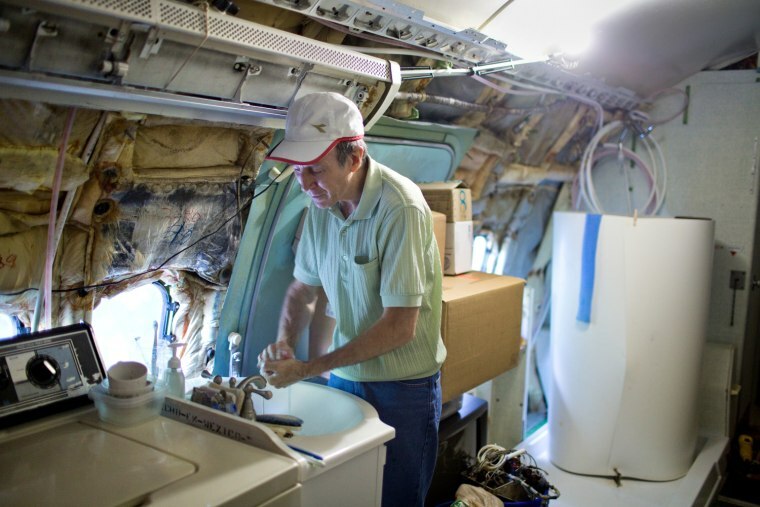 Campbell washes his hands at a sink he installed in the airplane. The plastic cylinder behind him serves as a shower enclosure. Grey water from the washing machine drains from the underside of the airplane. 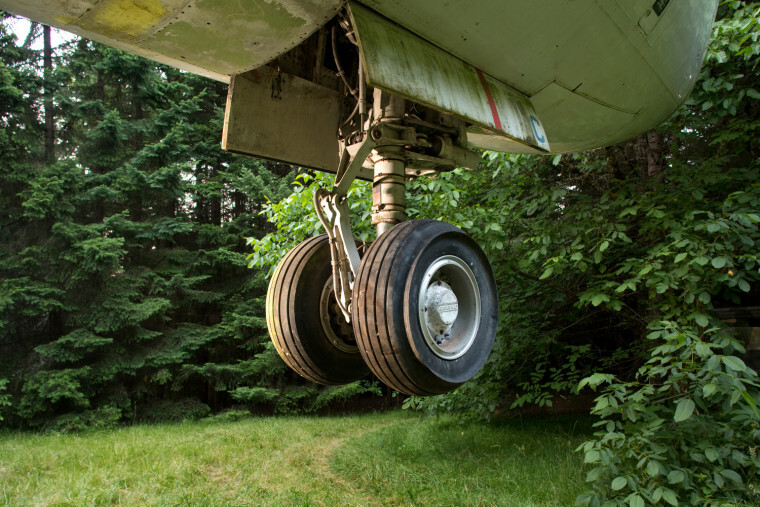 The front landing gear of the airplane hangs above ground. 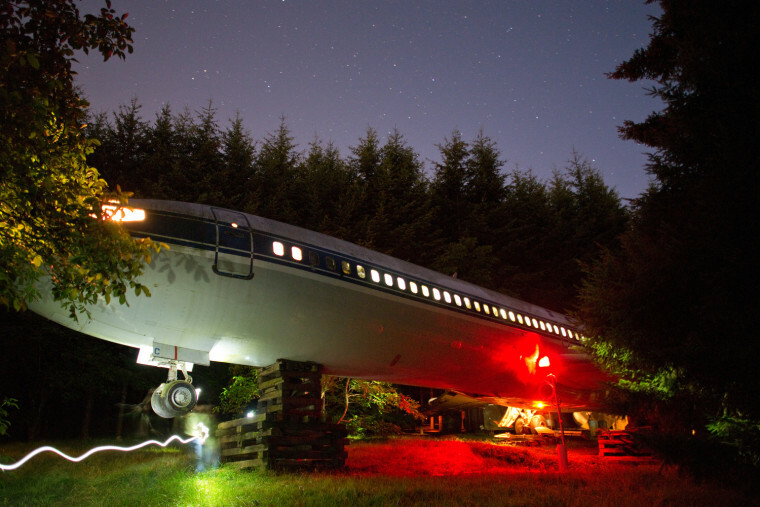 Campbell restored exterior lights on the airplane, but the property is still dark enough at night that he carries a flashlight to navigate the uneven ground. He shined that flashlight into the plane's nose landing gear for a few seconds during this exposure.